South L.A. Teens Doubt New Laws Will Change Gun Culture In South Los Angeles, murders, robberies and rapes are common — and so are guns and shootings. "We're so used to this," says one teen. "This is everyday life for us." Proposed gun laws don't seem relevant when so many old guns are stolen or passed around, and when serial numbers are filed off. On 53rd Street and Vermont Avenue in South Los Angeles, violent members of at least six gangs run the streets. A landmark church is boarded up and tagged. There are liquor stores and abandoned lots. On Tuesday night, there was a drive-by shooting two blocks away, and folks are expecting retaliation. 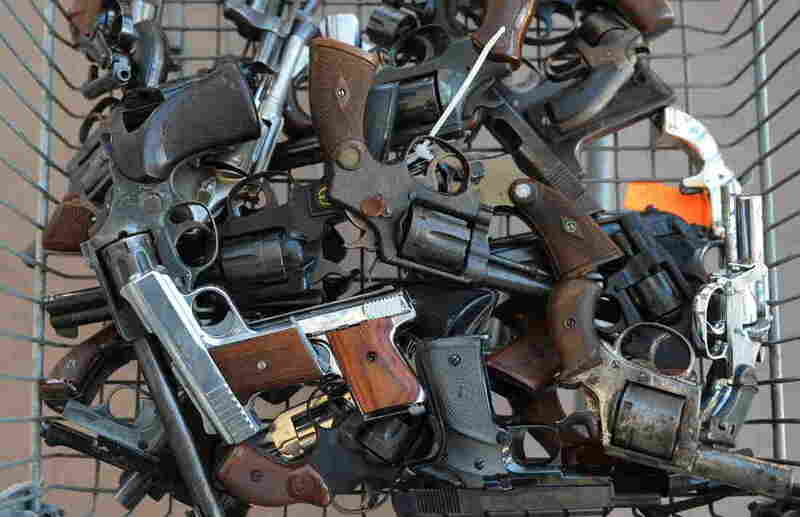 This is an area where murders, robberies and rapes are common — and so are guns. One person in the neighborhood got a big gun, somewhere in that neighborhood, where you can just look through it and just really blow somebody's brains out. "There's too many guns out there," says Randolph Wright, 18. "I can tell you right now, every hood has an AK[-47]. Regardless of whatever other gun they got, they have an AK." Adds Malak Rogers, 17: "One person in the neighborhood got a big gun, somewhere in that neighborhood, where you can just look through it and just really blow somebody's brains out." They seriously doubt much can be done about so much weaponry in their neighborhoods. "A lotta people do like their guns, like to show off," says Rogers. "They show people, like, 'Don't bother me, I got a gun. I'll do something with it.' "
Around here, there are no mass shootings on school campuses or in movie theaters. Instead, men, women and children are shot one, two, three at a time. And it happens all the time. Three days ago, Rogers was shot at in front of his house, during a drive-by from a rival gang. Everyone here has their share of stories. Map of reported crimes in L.A.
"I lost one of my friends from a stray bullet to the chest from gang violence," says Wright. "It's hard, because that was my best friend. I seen him die right in front of me." "My friend got killed because of his older brother," says Donna Lowe, 18. "They came and shot up the house. He got killed. He was in second grade with me, and his little sister, her hand got shot off, and his older cousin had to get a hip replacement. They were laying in the living room watching TV on the floor." And Rogers recalls an earlier incident. "I was chilling with my friends on my block. Some guys came through, and I got hit. Boom! My homie got hit in his neck. Boom! And my other homie got hit in his arm and his stomach." "We're so used to this," says Lowe. "This is everyday life for us." These teens say proposed federal gun laws — background checks on buyers, limits on ammunition magazines, a ban on assault weapon sales — don't seem so relevant in their neighborhoods. Not when so many old guns are passed around or stolen. Not when serial numbers are filed off. Not when guns aren't registered or bought at a store. "I can say it's very easy to get a gun out here. It's one phone call away," says Michael Trejo, 15. "That's how all these kids out here getting these guns. They don't have to [get] a background check or nothing." Trejo says he affiliates with a local gang. He's on probation now and was once shot at in an alley during a robbery. He doesn't want to give every detail, but does say he and his family are in what they call "the lifestyle." "You just go to your friend, and say, 'You know what? These people bothering me. I need a gun.' And that's how easy it is," he says. President Obama's proposals aren't going to get to those people who can just call their friends to get guns, he says. Trejo says one answer to curbing the gun violence may be more cops on the streets. The young people interviewed for this story say proposals to beef up security at schools are good, but what about all the areas outside of school grounds — the ganglands — they have to walk through? Things are so bad that students get bussed for just two blocks to an after-school program run by the Brotherhood Crusade. It offers after-school tutoring, sports and other activities to keep them busy and away from the streets. They have thoughtful discussions about the conditions in which they live. Malak Rogers, who's on probation and under house arrest, says he can only do so much to change the mentality of his hood. "I just tell my friends, hey, if you got a gun, just be careful, man. Don't just go out and kill nobody. If somebody gonna try to do something to you, then you handle 'em. Use your gun for good reasons. Say somebody's trying to kill you, or somebody's shooting at you, then use your gun. But just using your gun just because, that's not a good reason," he says. Rogers says he tells that to all his homies, and they're cool with that. But they don't always solve their beefs in other ways, he says. "Some of 'em, they'll talk it out. But some people can't talk it out too much. They just get fed up, and they just explode," he says. Rogers and others interviewed for this story say they're working on changing their lives. But the gun culture of South L.A.? This is still a place where you always have to watch your back.